SHANGHAI, Dec. 19, 2017 /PRNewswire/ — Yum China Holdings, Inc. (“Yum China” or “the Company”) (NYSE: YUMC), today announced the grand opening of the Yum China Building in Shanghai, China. 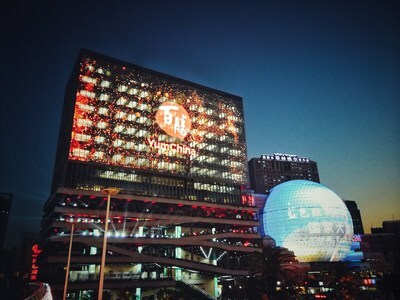 The Yum China Building is a leased property located in the heart of Xu Jia Hui, a central business precinct in Shanghai, and will accommodate Yum China’s Restaurant Support Center. Over 1,000 employees and the Company’s executives will be based in the new building, dedicated to supporting the growth of KFC, Pizza Hut, Taco Bell, East Dawning and Little Sheep in China. With the office interior designed to meet the gold standard of the Leadership in Energy and Environmental Design (LEED) building rating system, the Yum China Building incorporates a suite of advanced sustainable features that are intended to provide staff with the optimal working environment. Smart, low-carbon air conditioning systems save energy and ensure temperature and air flow are optimal. A cutting-edge air purification system has also been installed to guarantee excellent indoor air quality. Modern co-working spaces or “social hubs”, allow employees to meet and chat over a cup of coffee or during lunch. The contemporary layout also includes mobile work stations, equipped with adjustable tables and screens, so that employees can work more efficiently and exchange ideas across departments and levels. Employee health and wellness has also been prioritized, and the Yum China Building is equipped with facilities that can be used for exercise, yoga and team building activities. It includes four showers and rooms for physiotherapy and nursing mothers. In addition, chairs were selected by representatives from each department to ensure comfort and compliance with ergonomic standards. These designs reflect Yum China’s commitment to promoting the importance of healthy, active lifestyles.